We are manuafcturing Fire Detection System, Gas Detection System, Water Ingress Alarm System with De-watering system, Bridge Navigational Watch Alarm System, and Smoke Indicator for Boiler System,which were approved from most of Shipping Classification Societies. Also we're available to handle Fire & Gas Detection System for Offshore plant market. We have business relationship with heavy industries with global reputation such as Hyundai, Samsung, Daewoo, STX and so on. We have the facilities able to test the products in accordance with European regulation EN54-10, 54-11, 54-07, 54-05 and also have the test reports related to these EN54 regulations. 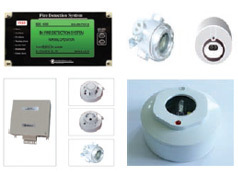 B-I Industrial Co., Ltd. has been manufacturing and supplying Fire Detection Systems, Gas Detection System, Water Ingress Detection Systems, Bridge Navigational Watch Alarm Systems and Gas Detector Systems to heavy industry companies like, HHI / DSME / SH I/ STX and others.